After you read all of the following you will definitely be on your way....we'll be looking for you. The River Valley Horsecamp near Farmington, IA has a lot to offer as you will see on this website but the unique cabins are really special. 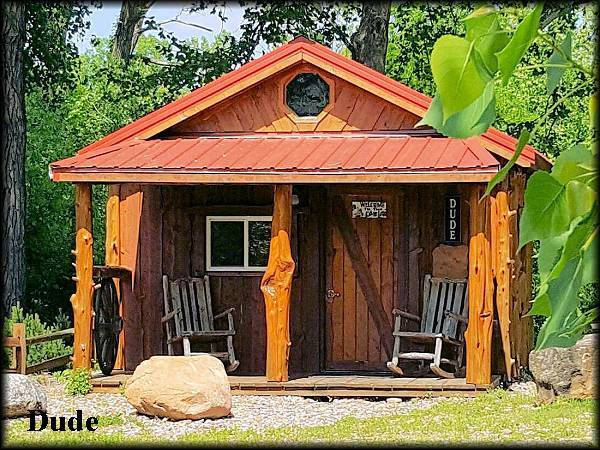 All the cabins were custom created for your camping experience. As you will see they come in various sizes and no two are alike. In short, they offer one of a kind lodging. A brief description of each one is listed below. Following all the descriptions you will find a titled picture of each cabin. 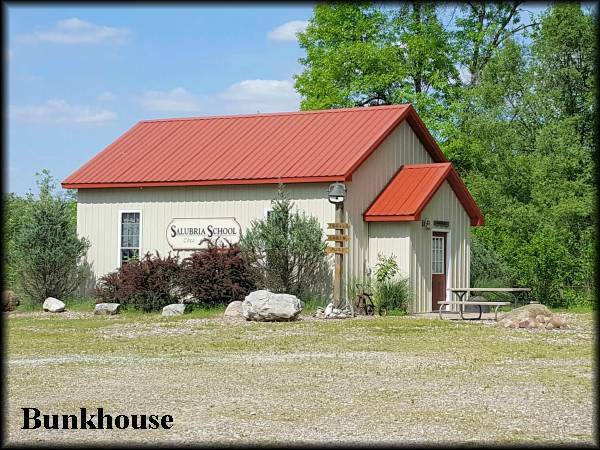 Bunk House - the bunk house is actually another historical building that was on the property. It is the former 19th century historic one room Salubria Schoolhouse. Although it has been totally remodeled to look like a log cabin inside, it still has an original chalkboard from another old school in the immediate area. 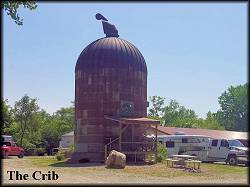 This unique building will sleep six (6) individuals (some say more than that) and offers heat, air conditioning, ceiling fans, and lights than can be dimmed. The bunk house includes a mini fridge and microwave. Two double beds and two twins bunked above the doubles. Bring your own bedding/sleeping bags, pillows, dishes, etc. If you don't have a camper this is excellent for overnight accommodations. The daily price of $100.00 includes one stall. Dude - It may look like an old log cabin but it is new and cozy. 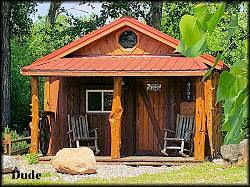 The cabin is air conditioned and heated and includes a mini fridge, microwave and a great front porch with rockers. This building is adjacent to the shower house. One double bed with a twin bunked above. Bring your own bedding/sleeping bags, pillows, dishes, etc. The daily price of $75.00 includes one stall. This distinctive one room cabin would make for quaint honeymoon or anniversary lodging. Of course, it does not have to be a special occasion to rent the cabin for a night or two. The Crib - This very unique cabin started its life as a 1940's Marin corn crib and the exterior still looks almost original. This two story accommodation with one queen bed and stairs to the loft which contains two twin beds bunked and a trundle style double. It has air conditioning, a dorm sized frig, and a small microwave for your convenience. This building is adjacent to a port-a-potty and only about 300 yards from the shower house. It offers a sitting porch with a bench and a view of the main arena. Bring your own bedding/sleeping bags, pillows, dishes, etc. The daily price of $100.00 includes one stall. This may well be the most unique cabin that you will ever see so don't pass it up. 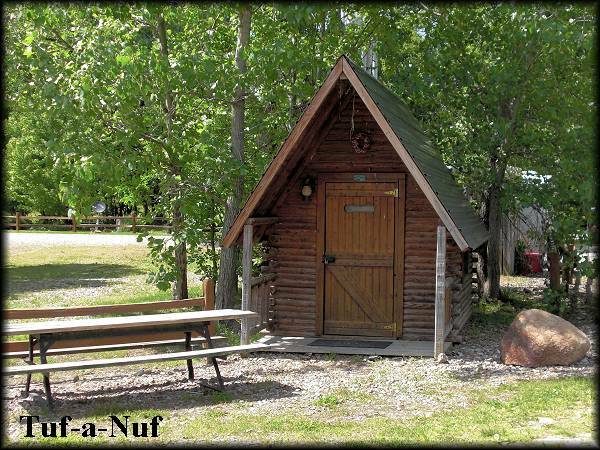 Tuf-a-Nuf - This is an "A" frame 6' by 9' one room cabin. It has two twin beds bunked and sleeps two. It offers air conditioning and is adjacent to the stalls and shower house and rents for only $50.00 per night and includes one stall. Bring your own bedding/sleeping bags, pillows, dishes, etc. 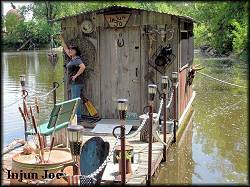 Injun Joe - Mark Twain would definitely be proud of this because I am almost sure that it is much like Huck Finn's boat. This is a very unique 7' by 10' cabin docked on a well stocked pond. It offers a private fishing dock (free fishing with cabin rental), tables and chairs, air conditioning, and two twin beds that obviously sleeps two. 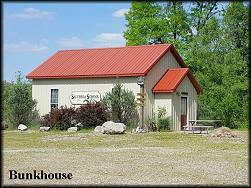 It is right over the hill from the shower house and rents for $75.00 per night which includes one stall. Bring your own bedding/sleeping bags, pillows, dishes, fishing poles, etc. 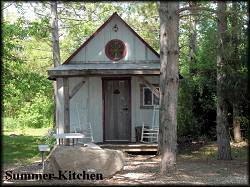 Summer Kitchen - An original vintage Summer Kitchen that was moved in from a homestead farm eight miles down the road. It is now a 12' by 14' cabin with a queen sized bed and a laddered loft with twin mattresses that altogether sleeps four. It also has a corner table, dorm frig, small microwave and a sitting porch with rockers. It is close to the stalls and a Port-a-Potty (the shower house is just across the pond). 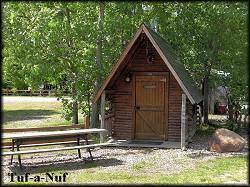 It rents for $75.00 per night which includes one stall. Bring your own bedding/sleeping bags, pillows, dishes, fishing poles, etc. The cabins are only the beginning of what this horse camp has to offer. Following is a brief description of several of the other amenities that make this a special place for you and your horse. Following all of the descriptions you will find a titled picture of most items. 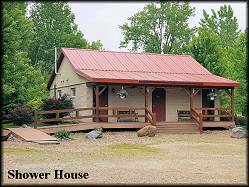 Shower House - this is a separate building that is divided into two (2) sections, one for men and the other for women. The men's side is decorated with camo walls, western lights, and deer blind seats. The women's side is decorated in copper, cedar, and pine, and includes a makeup area. 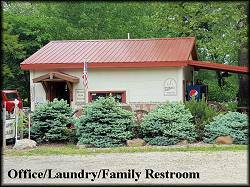 Of course both sides also include showers and restrooms and the facilities are handicapped accessible. 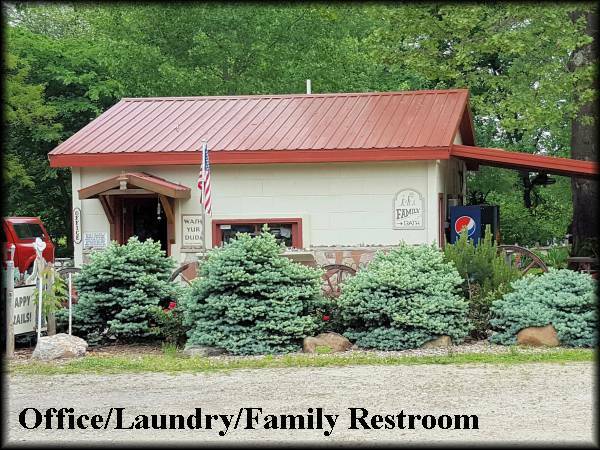 Laundry, Family Restroom, & Office - this complex was built on a location that was originally a limestone and gravel quarry and the original scale house was totally remodeled and converted into a coin operated laundry, family restroom and office. The scales are still intact which makes this a unique structure with a very practical use. The Iowa Territory "Injun Fort" - the kids will think that this is the ultimate western playground. Complete with a sand play area, a jail house door, and wooden guns to guard the fort. 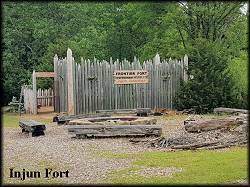 There is no doubt that the "Injun Fort" will be the perfect sitter. 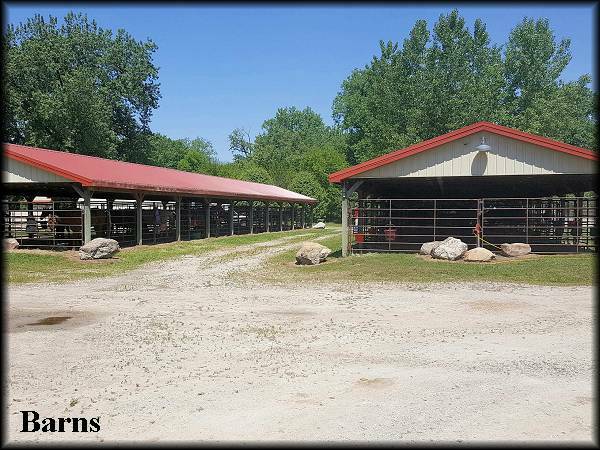 Five Horse Barns - four of the barns have twenty (20) 12' by 12' covered box stalls and the fifth barn has eighteen (18) covered stalls. There are also two smaller barns so in total there are 120 covered stalls. 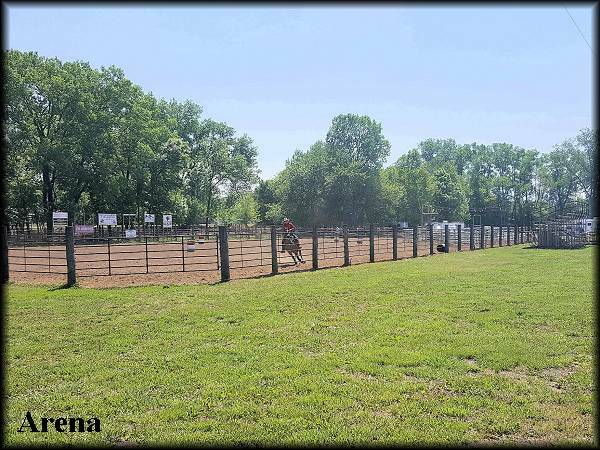 One stall is included free with each rental and people that have more than one horse may put two (2) horses in one (1) stall or they can rent another stall for a small fee. 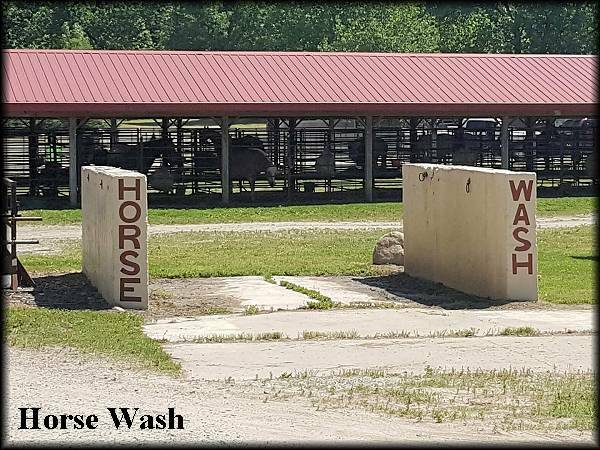 Horse Wash and Rolling Area - this is just another amenity for the horses which Steve and Carolyn think should be as comfortable as their owners. Although Farmington does not have a car wash, it definitely has a horse wash (see picture below). Horse Arena - the main horse arena is very well fenced and measures 140' by 250'. A full one (1) foot of sand was hauled in to make an excellent base for the arena. This is a great area the various events or for warm up riding or training. Besides this main arena there is also another area that can be used in the same ways as the main arena. Other Items & Services Available - soft drinks, ice, bedding, and firewood are available for sale on the premises. Just up the road approximately one mile in Farmington you will find a restaurant, a convenience store, a grocery store and more to supply your needs.